VoltAero has outlined its vision of hybrid-electric aviation with the company’s Cassio aircraft – participating in a summit meeting in Norway, which has set a goal of having the country’s domestic air traffic being “electrified” by the year 2040. 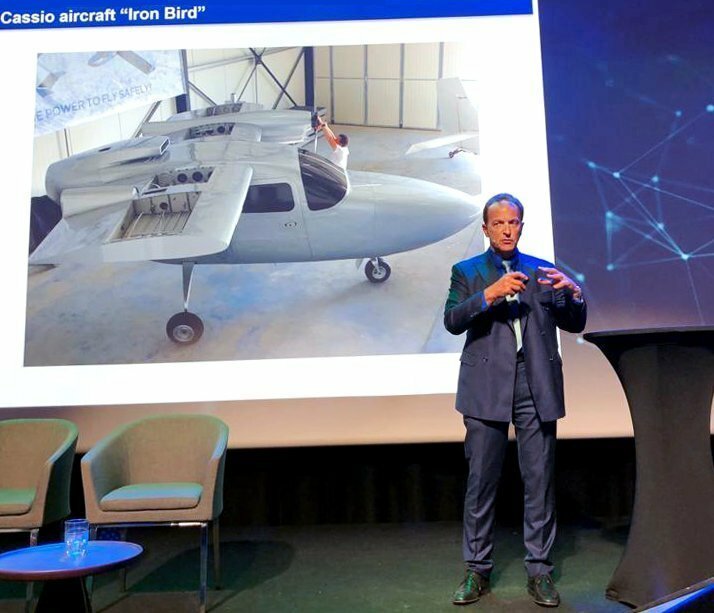 Speaking at the 2019 Nordic EV Summit in Oslo this month, CEO & Corporate Technical Officer Jean Botti underscored VoltAero’s pragmatic approach of applying technology that realistically supports the 2021-2022 timeframe service entry goal for its Cassio aircraft. 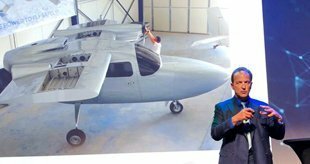 He highlighted the technical and technological milestones that need to be achieved – and certified by airworthiness authorities – before electric aircraft can be significantly scaled up in size. They include increasing battery power densities, validating cooling techniques for batteries, developing of high-power connectors, as well as dealing with electromagnetic interference (EMI) and compatibility (EMC) issues. During his presentation at the Nordic EV Summit, CEO & Corporate Technical Officer Jean Botti explains VoltAero’s phased strategy for the development, test and validation its Cassio hybrid-electric aircraft. “This is why VoltAero has sized the Cassio aircraft in the four-to-nine seat category, with a flight duration of at least 3.5 hours,” Botti explained, adding that Cassio will be well-tailored for such uses as point-to-point regional travel in commercial flights, for air taxi/charter companies, with private owners, as well as other utility-category applications. Speaking to the EV Summit audience, he described the Cassio aircraft’s unique distributed hybrid-electric propulsion system, which is protected by a patent submission. It’s “push-pull” configuration is composed of two wing-mounted electric motors to drive propellers in the tractor (“puller”) position, along with a “power module” in the aft fuselage that combines an electric motor and thermal engine which share the same shaft to a pusher propeller. Botti detailed the Cassio hybrid-electric propulsion system’s modes for the different phases of flight. They begin with an electric-powered landing gear wheel for ground taxi; followed by use of the electric motor-driven propellers for takeoff and landing (ensuring high energy efficiency and low-noise operations at airports). The aft fuselage power module’s thermal engine will turn the rear “pusher” propeller during cruise flight, also driving the associated electric motor as a generator to recharge the aircraft’s batteries. Botti explained that VoltAero is taking a modular approach to the Cassio aircraft’s operating modes, allowing them to be tailored for customers’ specific operational needs in terms of electric and hybrid-electric power. “The hybrid-electric propulsion system for Cassio was designed from the start to be highly efficient and secure, which is reflected by our motto: ‘The power to fly safely,’” he added. VoltAero CEO & Corporate Technical Officer Jean Botti (second from right) participated in the Nordic EV Summit panel discussion on the future of electric aviation. He was joined by (from left to right): Dag Falk-Petersen, CEO of Avinor, the Norweigan airport management company; Stein Nilsen, President and CEO of Widerøe AS, the largest regional airline in Scandinavia; and Kåre Gunnar Fløystad, Head of Policy and Research in ZERO (the Zero Emission Resource Organisation). Botti also underlined VoltAero’s prudent approach to development, testing and certification – using a flight demonstrator aircraft and ground-based “iron bird” system test rig to validate its hybrid-electric configuration. This will de-risk the Cassio configuration for its airworthiness certification and the subsequent application on a new-production airplane retaining the push-pull arrangement, and built using strong, lightweight composite materials. Looking to Norway’s ambition of transitioning its air transport sector to electric power, Botti said the Cassio aircraft will be highly suitable for the country’s aviation infrastructure – a point that was confirmed during the Nordic EV Summit by Dag Falk-Petersen, the CEO of Avinor (which operates under the Norwegian Ministry of Transport and Communications, with responsibility for managing 44 state-owned airports). Falk-Petersen explained that Norway offers a unique airport network and an established market for short-range flights with small aircraft. Additionally, Norway’s goals for the electrification of its air transport sector has broad support from the government, parliament and other stakeholders. “Aircraft producers are looking for a market and a customer; and we have both!” he concluded.